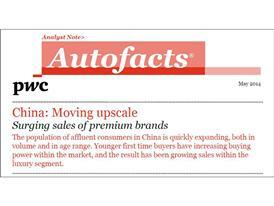 DETROIT, 2 June 2014 ― Automakers keep sights on the China market as premium brands continue to rise, according to PwC’s Autofacts latest Analyst Note. In the last decade, the China market expanded nearly five-fold, from 4.3 million vehicles to 19.9 million. This increase continued through the global downturn, when other automotive markets were experiencing severe declines. Within the industry, luxury vehicles have seen a particularly impressive growth in the last several years. Even as the Chinese market grew only marginally in 2011, the luxury segment still grew 54.5 percent. By the end of 2013, the segment was still enjoying double-digit growth of 18.4 percent, reaching sales of 1.4 million units, second only to the US. China is expected to surpass the US in luxury sales by 2016. The population of affluent consumers in China is quickly expanding, both in volume and in age range. Younger first time buyers have increasing buying power within the market, and the result has been growing sales within the luxury segment. Premium brands appeal to those amassing greater wealth — a demographic shift that is rapidly expanding in China to younger generations that are hungry for consumer goods that show their higher status. Luxury vehicles have an expected compounded annual growth rate (CAGR) of 11.5 percent from 2013 to 2020, which is almost double the rate of standard, non-premium light vehicles. 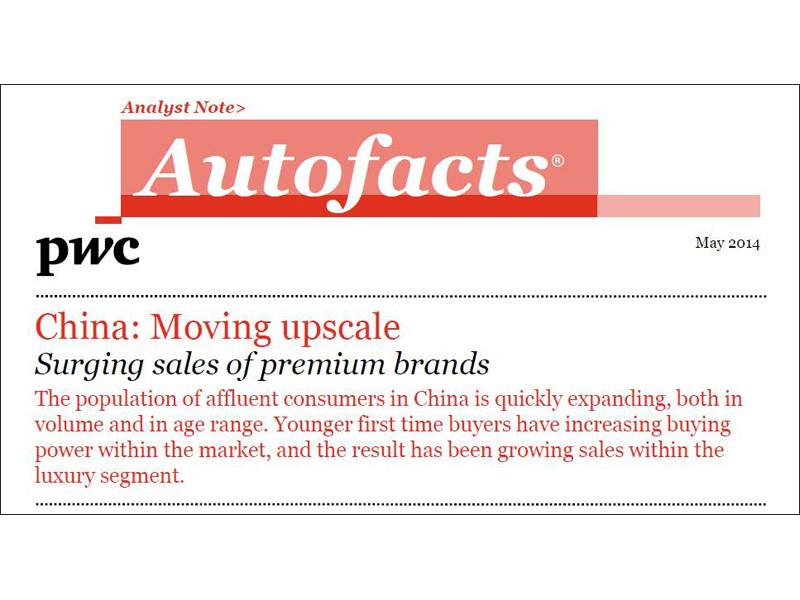 Autofacts is forecasting that the Chinese market will surpass the average luxury penetration rate of 10 percent of mature markets like the US to reach just over three million units by 2020. Assembly localization has cost advantages including; local sourcing, market research and development, and creation of a streamlined value chain within the country. Localization can also reap benefits long-term, both with government and legislative incentives as well as minimizing additional import duties. Establishing a local base not only demonstrates a commitment to the market, but allows for cost savings and the ability to remain agile in a dynamic market where consumer preferences can shift quickly. For more information about PwC’s Autofacts Analyst Note, download the May issue at www.autofacts.com or download the Autofacts app. PwC's global automotive practice leverages its extensive experience in the industry to help companies solve complex business challenges with efficiency and quality. One of PwC's global automotive practice's key competitive advantages is Autofacts®, a team of automotive industry specialists dedicated to ongoing analysis of sector trends. Autofacts provides our team of more than 4,800 automotive professionals and our clients with data and analysis to assess implications, make recommendations, and support decisions to compete in the global marketplace.